The combination of chi dragons and crizzled glass allows an attribution here to the imperial glassworks. The crizzling is on the inside surface of the colourless glass only, but it is quite extensive. This level of crizzling, often concentrated on the inner surface, is found on several known Qianlong bottles and is distinct from the overall crizzling on known Kangxi colourless glass. It may be that constant handling may diminish the effects of crizzling on the exterior surface of snuff bottles, in which case this may be earlier than it first appears. An alternative is that this sort of crizzling results from a cause other than glass disease. Although an early Qianlong date is quite possible, the pale colour of the blue overlay and its unusual low relief do not appear to be typical of products from that time. We suspect it is more likely to date from the very late Kangxi or Yongzheng reigns and therefore may be one of our earliest known overlay glass bottles. The interior bubble is somewhat irregular and does not match the contour of the outer form. On a bottle displaying such superior workmanship in relation to the carving of the relief detail, including the footrim, this seems completely atypical for any time during the Qianlong period, again endorsing a likely early date. The footrim also exhibits an unusual groove, carved to separate it visually from the body of the bottle - another indication that this may have been made during a period of experimentation. Neatly executed, it is obviously original but a very rare feature, and one that might be expected of a carver experimenting with a new art form. Once overlaid foot rims became standard, this strange and rather unnecessary feature would have been abandoned. Irrespective of its date, it remains one of the finest of all these popular, imperial chi dragon motifs, and the beasts here are most emphatically not mere formulaic repetitions of a standard design. Artistically vital, they are superbly fluid in their ‘drawing’ and as powerfully dynamic as any chi dragons ever carved. This high level of art is matched by flawless technical control of the medium, leaving well-rounded and perfectly finished relief set against a ground plane displaying immaculate formal integrity. 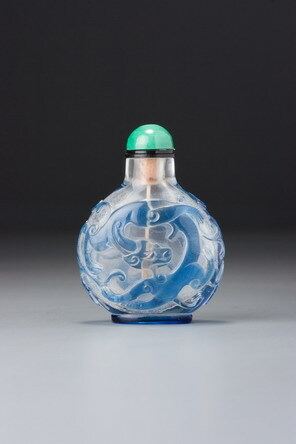 Fluent, flawless, and fabulous, this magnificent bottle represents the epitome of Chinese glass carving.